Super cheap non-stop flights Paris to Montreal just €96 return! Cheap non-stop flights from Amsterdam to Toronto, Canada from €298! Oneworld cheap return flights from Frankfurt to USA from €216! 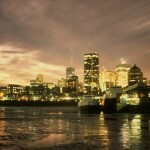 Super cheap non-stop flights Paris to Montreal just €96 return based on service of Corsair. Do not expect this incredible offer will last long so if you are quick grab probably the cheapest flights from Europe to Canada / North America and fly for such a crazy low fare to from Paris Orly to Montreal next spring or autumn 2019! Fare is for a roundtrip incl. all taxes and fees + 10kg hand bag but excluding checked luggage..To be on a safe side we recommend you book this deal directly with the airlines. This is indeed great option for almost anyone in Europe planning to visit Eastern Canada! Simply follow one of below links before this is gone.. *UPDATE*. : This deal is no longer available..
Firstly as this is extremly low-priced offer from Europe to Canada we do recommend you book your hotel room or connection flight only at least few weeks after you receive formal booking confirmation. Corsair promotion is avaible for flights in travel period from 1st of April to 28th of June or 18th of August to 31st of October 2019. Max stay 3 months. You can book this incredible discount by 15th of December but we are pretty sure this incredible discount will not last long..
Booking sample of Super cheap non-stop flights Paris to Montreal just €96 return. In this case you would depart from France to Canada on 6th of May. Inbound from North America back to Europe on 20th of May 2019.